The car is a great place to practice speech/language skills and strategies. Take advantage of time spent in the car by playing some fun, language-based games. Categories: To play this game, one player chooses a category, such as “animals.” Every player takes a turn naming an item in the category. If a player repeats a word or is unable to name a word in the category, he/she is out. Play continues until one player remains and wins the game. To make this task more complex, have the child add more descriptive words to the category (e.g., animals with tails, animals that live in the zoo) or name animals alphabetically (eg., aardvark, bear, cat, dog, etc.). Rhyme Time: To practice phonological awareness skills, children can practice creating rhymes for things they see from the car window or in the environment around them. For example, if a child chooses the word “tree,” other players must name some rhyming words (e.g., knee, see, me). The player who gives the most rhymes is the winner! As an added bonus, players can create rhymes using nonsense words (e.g., slee, dree). Other players take turns identifying whether the rhyming word is a real word or a nonsense word. Cities and Syllables: As you pass through different towns, cities, or states, children can practice counting the number of syllables in that city or state’s name. For example, when passing through Idaho, the child counts or claps out three syllables. When passing through Tallahassee, the child counts/claps out four syllables. In a variation of this game, a parent chooses a particular number of syllables. Players look for words in the environment (e.g., road signs, billboards) that contain the specified number of syllables. Each player earns a point for finding a word. The player with the most points wins! Guess It: Players take turns describing familiar items or objects (e.g., car, apple, baby). The first player chooses an object and gives three clues to describe it. All of the other players take turns guessing what the first player is describing (e.g., It is a fruit; it can be red or green; it grows on a tree). If no players guess correctly, the first player provides another clue about the object. The player who correctly identifies the mystery object earns a point and chooses the next word to describe. How does this character feel? Why? How can you tell? When was a time that you felt that way? What was your favorite part of the movie? Why? At the end of the film, have the child retell the story to another person in the car. The story should include characters, settings, chronological events, and a conclusion. Encourage the child to produce a story with a beginning, middle, and end. 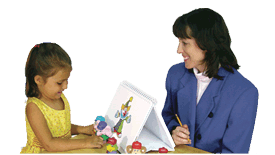 Apps: Educational apps that help children practice language skills are available for tablets or smartphones. Apps like Super Duper’s StoryMaker are interactive and engaging. Apps can address several domains of language: grammar, vocabulary, and social skills. Long rides in the car can be fun and educational! Playing games during long trips is a great way to expand and reinforce language skills.